Step aside Silicon Valley, there's a new kid in town. She lives in the mountains, rides a unicorn to school, and is brimming with innovative ideas. She's looking forward to a future where computer science education is available in schools throughout Utah, and where gender bias will not hold her back from excelling in her career. Her name is Silicon Slopes. Founded by the CEOs of Vivint, Pluralsight, Qualtrics, Domo, and InsideSales, the Silicon Slopes Tech Summit attracted approximately 24,000 attendees. Other than Vivint, the founding companies also happen to be Utah-born unicorns, or private startups valued at $1 billion or more. Companies big and small set up booths in the sponsor pavilion to showcase their place in the state's booming tech industry. It should be noted that Ivanti has been around much longer than many of the tech companies that have emerged in recent times. Est. in 1985, we're kind of a grandfather in the industry, so to speak. But a cool one. A grandfather who wears the latest Air Jordans and knows how to do the floss. Just look at the caliber of guests we interviewed on our live Interchange IT Podcast at our booth! Former NFL star Will Tukuafu was engaging and down-to-earth, despite having played for the San Francisco 49ers (2010 to 2013) and the Seattle Seahawks (2014 to 2016). Did we mention he also played in two Super Bowls? We were also lucky enough to interview famed recording artist Alex Boyé, whose larger-than-life stage personality and impromptu performance were highlights of the event. 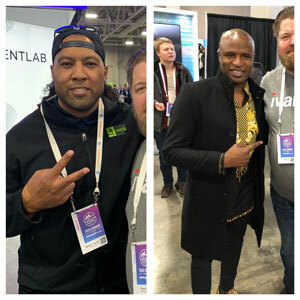 Celebrities at the booth aside, #SSTS19 was also the backdrop for some groundbreaking moments and announcements. During the opening session, the conference founders were called onstage to announce that each of them will donate $1 million to fund computer science education in all schools throughout Utah by the year 2022. Rivaling the excitement of that moment was when the Nasdaq made history by closing for the first time in Utah. Nasdaq also conducted interviews during the summit, including an interview with our CEO Steve Daly. There were also a few standout quotes from the keynote speakers. Adobe founder Jon Warnock spoke about his determination to out-invent his early competition, albeit while creating and maintaining a healthy work culture. Co-Founder and CEO of All In Together, Lauren Leader, spoke about the rampant under-representation of women in both the workplace and the political arena. She is the author of Crossing the Thinnest Line. Baseball star Álex Rodríguez had simple but powerful advice for business leaders. And at the risk of showing my own bias, Ivanti's CEO Steve Daly and CMO Steve Morton know exactly what it means to create an awesome work environment. In a Friday breakout session, they spoke about Ivanti history, products, and the unique culture that has us excited to come to work every day. Until next year, Silicon Slopes!